A collision of performance and photography reflecting the nation's popular taste for the period costume drama and nostalgia for a utopian past at the heart of 'little' England. “Diary of a Victorian Dandy” was a collision of performance and photography reflecting the nation’s popular taste for the period costume drama and nostalgia for a utopian past at the heart of ‘little’ England. The production was shot on location over a period of three days in the opulent and sumptuous environment of a stately home in Hertfordshire. The artist Yinka Shonibare is the central character of the dandy and orchestrates an ensemble of professional actors, a make-up artist, a stylist, a photographer and a director. Behind the superficiality and self-satisfaction of Shonibare’s Dandy lies a deeper social resonance. The work is a powerful parody of the artist’s own life as a creative black British man living with a physical disability in contemporary Britain. He alludes to a black aspirational designer generation, the contradictory social codes implied in the conspicuous sartorial elegance of figures such as Chris Eubank and the keeping-up-appearances mentality of the contemporary British ‘dude’ scene. 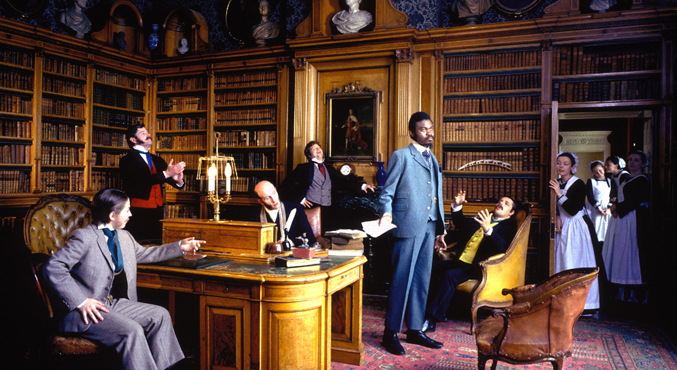 Throughout October 1998, inIVA presented the photographic series ‘Diary of a Victorian Dandy’ by the artist Yinka Shonibare at poster sites in London Underground stations. The series resulted out of his performance over a period of three days as dandy at a stately home in Herefordshire. Frivolous and elegant, as we follow a-day-in-the-life of a pretentious poseur who scales the dizzy heights of the British elite, with vanity and la-di-da airs and graces, through scenes with his valet, gambling in the billiards rooms and of course, the naughty parties. The series of five large photographs were then shown as a touring exhibition at the Castle Museum and Art Gallery, Nottingham; at the Laing Art Gallery, Higham Place in Newcastle upon Tyne and at the Towner Art Gallery and Museum at Eastbourne in 1999 / 2000.